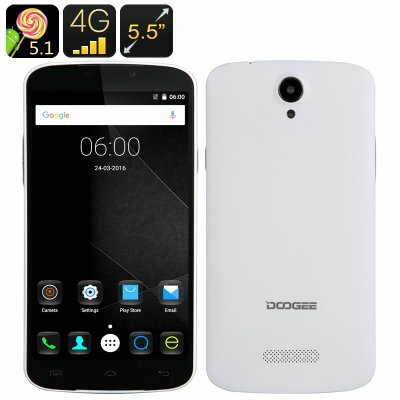 Successfully Added DOOGEE X6 Pro Smartphone - Android 5.1, 4G, 3000mAh Battery, Smart Wake, Gesture Sensing, Two SIM Cards (White) to your Shopping Cart. A nice 5.5 inch HD screen, Android 5.1, 4G connectivity on two SIM cards, a capacitive 300mAh battery, the MTK6735 64bit Quad Core CPU and more. The DOOGEE X6 Pro comes with lots of great features: the large 5.5 inch HD screen, Android 5.1 interface, Play Store access and Over-The-Air software upgrades are all there. It also sports two of the relatively new smartphone features – Smart Wake and Gesture Sensing - that are great navigation tools for Android smartphones. Smart Wake lets you access a set of selected apps right from the locked screen. This is a great option for those applications that you usually need to get quickly to, like Camera, Web Browser, Messages and so on. Simply draw a corresponding letter on the smartphone’s locked screen (i.e. “E” for Browser), and you will get directly into the needed app. Gesture Sensing is another cool add-on. This one allows you to control certain device functions with movements: simply wave your hand to skip between music tracks or move from one opened app to another. The DOOGEE X6 Pro lets you talk non-stop for 10 whole hours – thanks to the massive 3000mAh battery and offers 16GB of internal storage +32GB on an SD card. The Android smartphone also features two cameras, GPS support and Bluetooth 4.0 – for quick and efficient wireless communication with other devices.